Since I’m not really a fan of patterns, I had to wait for a time when I could think about how to design and think of a way to make a platypus. I tried some fuzzy yarn but then realized that it would be harder to wash and for kiddo to chew on. I started and stopped several times because of holiday knitting. 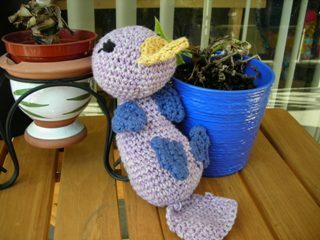 But, finally a couple of weeks ago I finished Polly the Purple Platypus. So, a Martian it is. Don’t have a name for him yet, but have been kicking around a few. For now he’s just Little Martian. Have another knitted amigurumi I’m working on. Might even have time to post the pattern (if kiddo doesn’t come within the next week or two!). Yay amigurumi! They both look very cute! Those are really cute. I need to take a stab at knitting again. I love Little Martian. He/she makes me happy. Holy cow, those are so adorable! Love these! I am such a Virgo and always try to follow patterns strictly. You make me want to try knitting without a pattern. That’s best way to understand different techniques, I think. We missed you at the meeting. Mariko, Jill, Jill & I wondered how you were doing. So the due date is almost here? How are you doing? They are so cute!! I’ve been looking for a cute Perry the Platypus, and your platypus looks almost exactly like Perry. Could you please post the pattern?? Please? Thanks! I love the Platypus! I would love to get the pattern if possible. I also would love the platypus pattern! My son has been begging for a Perry the Platypus stuffed animal. I have yet to find him one, and I would love to try and make one if I could find a pattern. So far no luck, but this one is much closer than anything else I have seen! Thanks so much? I don’t really have a pattern and time has been so crunched recently that I haven’t been knitting or crocheting much. If I get a few moments, I’ll look at Polly and try to remember what I did! I LOVE the platypus….any chance of purchasing one? Thanks so much! 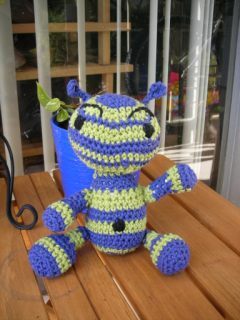 Unfortunately I don’t really make amigurumi to sell these days (with the recession, work and a kid I don’t have much time). Are you interested in a pattern or a doll itself? i would really like to purchase one!! i would like to have the doll, but if not then the pattern please! Okay so my mom loves to crochet and i asked her to make me an animal, well my favorite animal is a platypus. Ive looked everywhere for a pattern and well yours by far is the cutest! Now i know you said you didnt have a pattern but is there anyway you can give a rough outline of what you did? anything would help! thanks!